As I work with my clients, I strongly suggest working with a registered dietitian during recovery. There are times when questions surface during session can be better answered by a dietitian rather than an eating disorder therapist. Dietitians are an integral part of an eating disorder treatment team. Registered dietitians are educated professionals who know about not only food but also the way nutrition interacts with our unique bodies along with how nutrition can help improve our overall wellbeing. 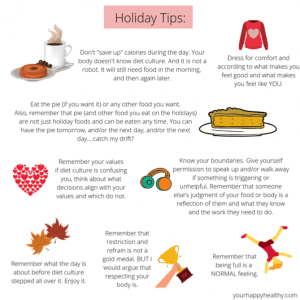 Eating disorder recovery during holidays can be tricky! 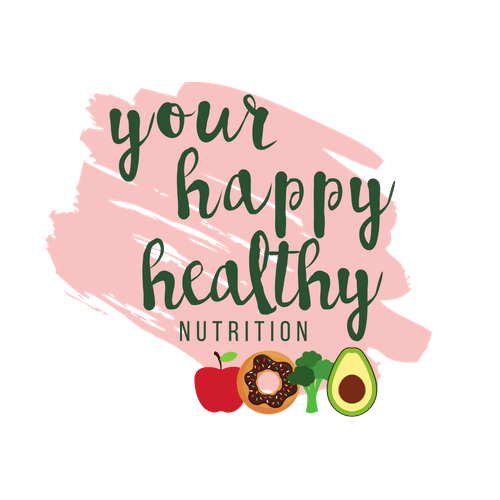 Westminster Based Registered Dietitian Nutritionist helps answer questions from individuals who struggle with disordered eating and eating disorders. During the holidays, I usually skip meals throughout the day to eat at all the houses we go to. I am usually lightheaded by the first house. How can I create a more balanced day while also enjoying myself? When it comes to holidays and celebrations, eating out of routine can make us feel a bit uncomfortable and confused. The reason eating on holidays can be so tricky it because holiday happenings threaten the rules that we pick up from “diet culture.” Diet culture is all around us from the magazines we read and the advertisements we see, to our friends’ comments about their latest fad diet they are embarking on. Diet culture is a society that places value and importance on being a certain size, weight, and shape over actual health. 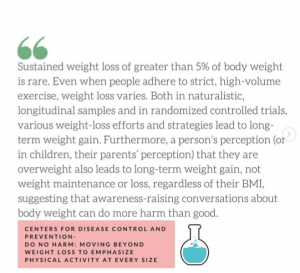 Blindly following rules that value size over health can lead us to unhealthy behaviors and outcomes. Therefore, to address your question, first, I would ask- Why would we choose to skip meals? What are the motives behind this decision? 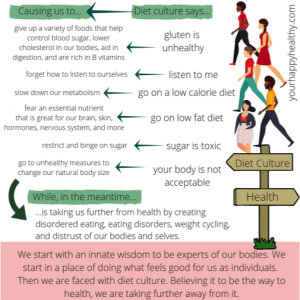 I would argue that we chose to skip meals because we have been fed the message by diet culture that we should save up for the calories that we are planning on consuming later. Second, I would ask whether or not this decision is the healthy one. Is skipping meals when we are hungry actually health-promoting? Let’s talk about the health consequences of skipping meals. When we skip meals, many unpleasant consequences can happen. Short term effects can be a drop in blood sugar making us feel dizzy, lightheaded, irritated, and super hungry. 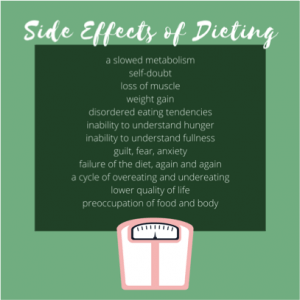 Long term effects of skipping meals (dieting) can slow down our metabolism, cause us to be very out of tune with our hunger and fullness cues, and lead us to distrust and disrespect our body and it’s needs. Our bodies may think food is scare. Our bodies want to know that they we are not starving and that there is food around. Despite our minds being aware that there is a big meal planned later in the day, our body doesn’t understand why it is not getting fed. It still needs energy leading up to that meal in order to function optimally. By skipping meals, we set our bodies up to be famished by the time we do allow yourselves to eat. In response, our bodies will naturally try and make up for lost calories and eat all the food it can muster due to all of the restriction throughout the day. We then go from uncomfortably hungry to uncomfortably full. Restriction sets us up for the classic restrict-binge cycle of eating, which is a less enjoyable and unbalanced way of eating. 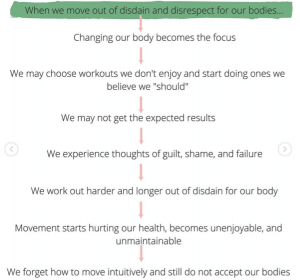 Lastly, and most importantly, when we tell ourselves that we can not eat during the day and choose to ignore our hunger, we are telling ourselves that our body’s signals should not be trusted or respected. So what should we do? How can we create more balance on the holidays? Protein, fat, and carbohydrates: This balance will help us to satisfy our hunger and keep us full longer. Satisfaction factor: When we are craving a certain food, we must allow ourselves to satisfy that craving. This will prevent those binges I talked about above. When we tell ourselves that some foods are off limits, we are setting ourselves up for a binge later. For example, if we allow ourselves only veggies prior to the festivities and ignore the craving for something sweet, when we finally decide to allow ourselves pie, it is likely that we will overeat the pie to a point of discomfort rather than to a point of comfortable fullness, thinking that this is the one and only time we can eat pie. 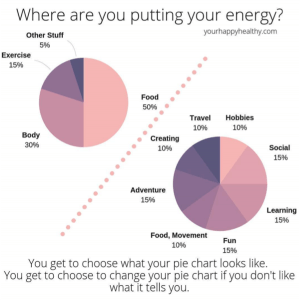 Let your body and mind know that you can have pie WHENEVER you want and that you are not only allowed pie on the holidays. Throughout the holiday, be mindful in the moments leading up to the festivities as well as during the festivities and practice honoring your body without the guilt. Be mindful, eat all meals, allow yourself snacks, don’t ignore your hunger, honor your cravings, and listen to your body. Tune in to see how your body is feeling. Is it hungry? Is it full? Is it craving a certain food? Is it satisfied? Check in with your mind and body rather than blindly following rules. I try to get in rigorous workouts to allow me more food choices during the holidays. I usually have a “who cares” attitude with each place we stop on the holidays because I got a workout in earlier that day. This happens every year. Is this a problem? Kudos to you for asking yourself these questions. Working to understand our relationship with food and exercise can help bring us to a place where we are able to make healthy, confident health choices based on self-respect and self-acceptance. To best help us answer this question above, we must consider our relationship and intention behind movement. Diet culture likes to tell us that exercise should be done because our body isn’t good enough and because our food needs to be worked off. This kind of mentality makes exercise unenjoyable and can lead to unhealthy behaviors. Telling ourselves that we need to move in order to eat sets us up to believe that we have to earn our food. 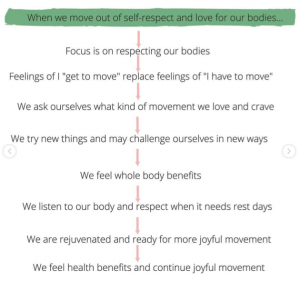 Telling ourselves we need to move to fix our bodies perpetuates the idea that our bodies are not good enough as they are. The last thing we want to do is associate joyful movement and our innate desire to move with these negative ideas. 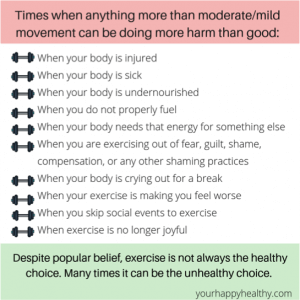 This can make anyone hate exercise and discourage movement. Similar to food choices, we should be making exercise decisions from a place of intuition, with respect for our bodies and minds, and with the the satisfaction factor in mind. On the day of your holiday celebrations, tune into your body. Check in to see how your body and mind feel. Ask yourself what your motives are behind movement. If you feel like moving, ask yourself what kind of movement seems enjoyable. When you are exercising, allow yourself to stop when your body is asking you to stop. 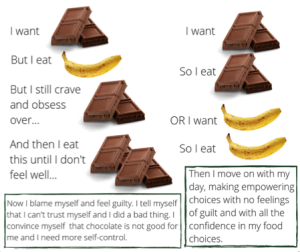 How can I avoid failing on the repetitive New Years resolution about changing food choices and losing weight? It never works for me. Reflecting on your diet history. How has it negatively affected you? Surround yourself with positive influences and declutter the diet messages from your life. Ask yourself where you would rather put your energy this year? Make a more meaningful resolution that aligns with your values. Check out some alternatives to diet resolutions here! 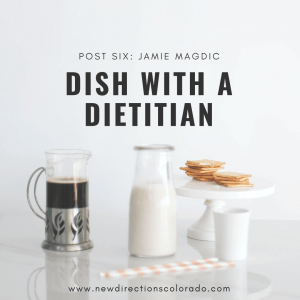 Jamie Magdic is a registered dietitian nutritionist and owner of “Your Happy Healthy, LLC.” Jamie works both virtually and locally in the Westminster, Colorado area, where she lives her passion, helping people heal their relationships with both food and their bodies. 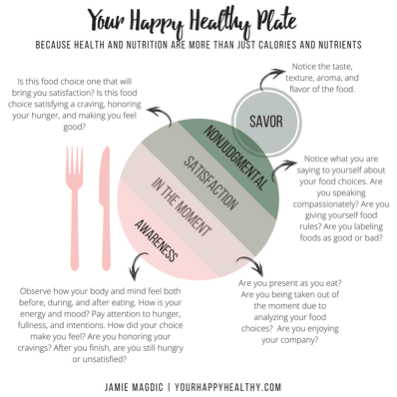 Jamie believes that in order to properly nourish and take care of our bodies, we must approach health from a place of self-compassion and self-acceptance, where all foods fit, and where both the mind and body are taken care of. 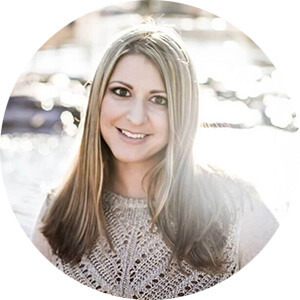 Jamie helps her clients rediscover their innate ability to be their own best nutritionist, to trust their bodies, and to learn how to be nourished from the inside out. 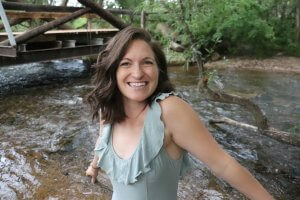 She specializes in eating disorder recovery, health at every size, intuitive eating, eating disorders, disordered eating, body image, and exercise addiction. Jamie recently launched her first ebook called “Beginner Tips to Ditch the Diet and Move Toward Eating Intuitively.” This +100 page eBook started as a ten day Instagram challenge with the goal of giving followers the resources and support needed to quit dieting for good. With its success, Jamie decided to make the challenge into an eBook, featuring the experts in the field of intuitive eating, making this eBook the perfect resource for supporting your journey in healing your relationship with both food and your body.